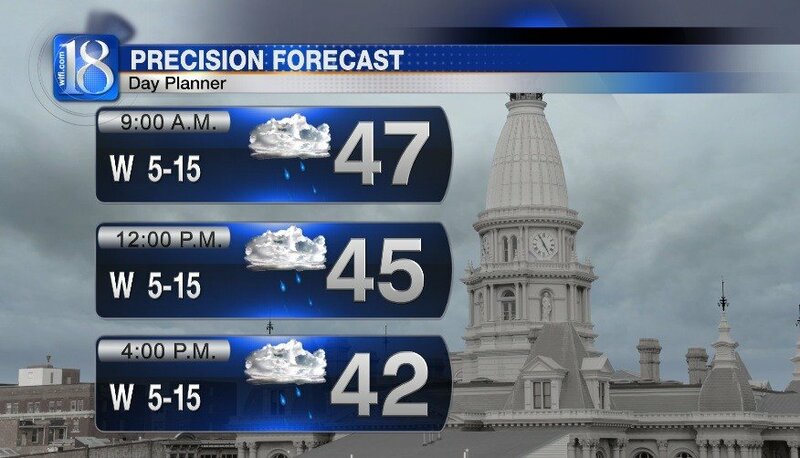 Not only will there be rain chances today, but temperatures will gradually fall. This morning is going to be the “warmest” time of the day with temperatures in the upper 40s. We will drop into the lower. 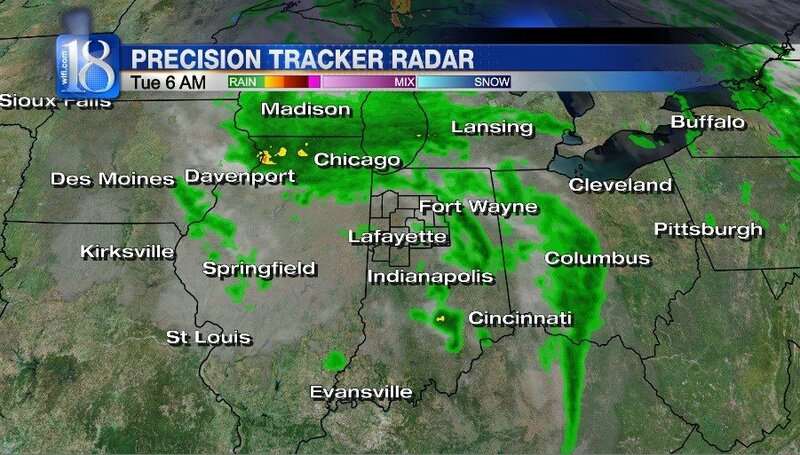 We are tracking more rain on Precision 18 Radar this morning. 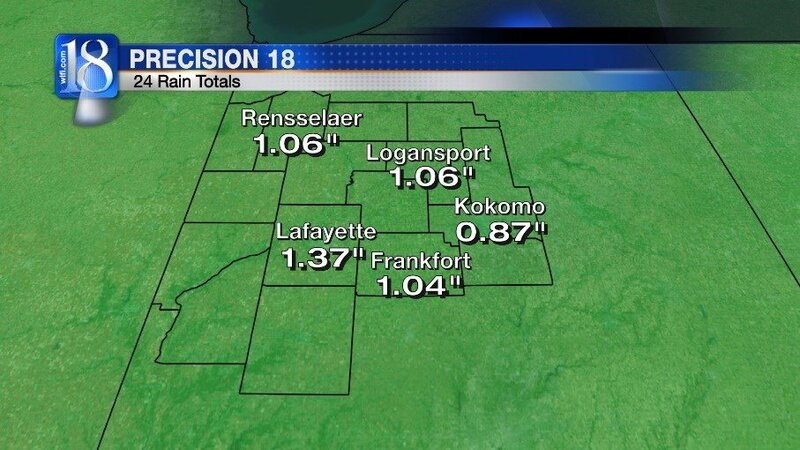 The rainfall is from the same system that brought showers to the area yesterday. A few showers are in the forecast this morning, then the rainfall will become more widespread during the afternoon. 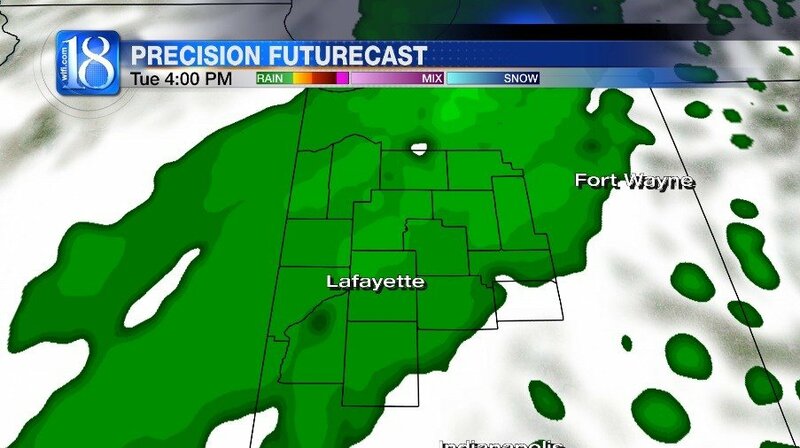 Moisture will wrap around the low pressure system through the afternoon and evening. 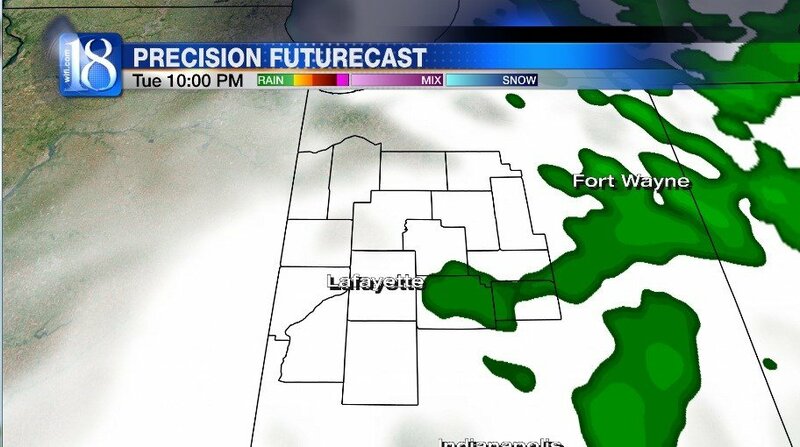 Precision Futurecast has the rainfall moving out of Greater Lafayette between 9 and 10 p.m. EDT. 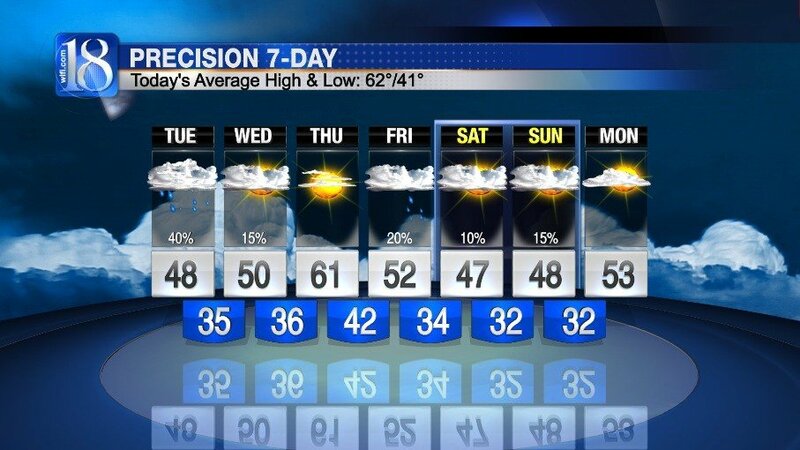 Not only will there be rain chances today, but temperatures will gradually fall. This morning is going to be the “warmest” time of the day with temperatures in the upper 40s. We will drop into the lower 40s by the evening commute. 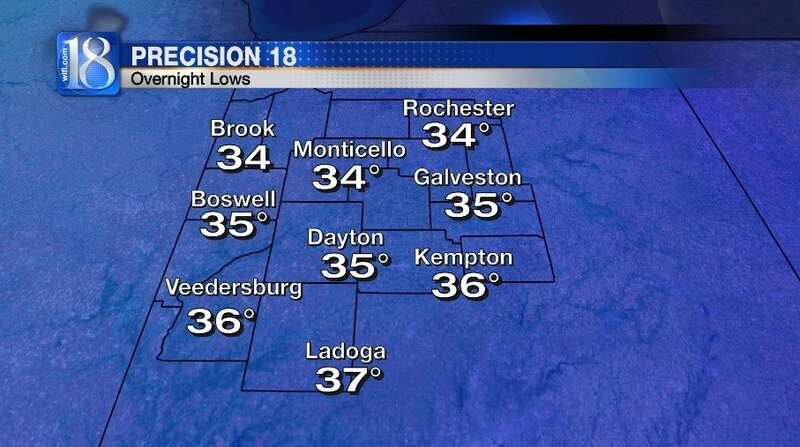 Clearing skies during the overnight hours will allow lows to plummet into the mid-30s by tomorrow morning’s commute! A winter coat will likely be needed at the bus stop tomorrow morning. Cloud cover is going to build back into the area by Wednesday afternoon and there could be an occasional shower in the area. 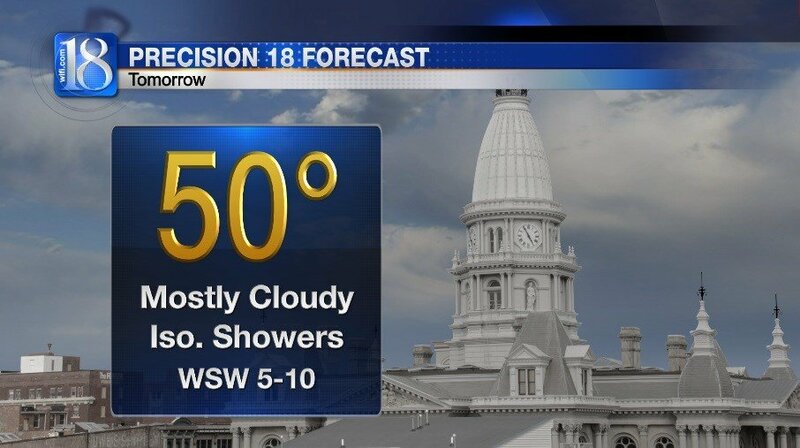 However, there are going to be several dry hours for your Wednesday with highs near the 50° mark. Thursday will bring sunshine and the warmest weather of the work week. Highs will climb back into the lower 60s Thursday afternoon. There is going to be another system that will arrive on Friday. Rain chances will return Friday night. We could even see a light rain-snow mix late Saturday night into Sunday morning as temperatures fall near freezing!